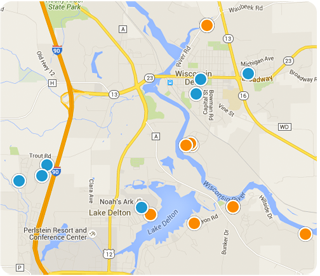 Find Real Estate Listings and buy or sell homes in Wisconsin Dells, Lake Delton, Baraboo, and surrounding areas of WI. We specialize in Wisconsin Dells Real Estate residential, condos, vacation homes, log homes, waterfront property either on Lakes such as Lake Delton, Mirror Lake, Lake Redstone or the Wisconsin River. Searching for a condo for sale in Wisconsin Dells? Try our condo search! We strive to be better than other real estate companies. We provide the very best in customer service! We answer our phones seven days a week and also in the evenings. We return emails in a timely manner. Our focus is Wisconsin Dells Homes For Sale and Wisconsin Dells Condos For Sale. Kimball Realtors LLC are positive, progressive, passionate and productive. We make our clients and customers feel informed and educated. We stay in contact with you through the entire transaction from the very beginning to closing. Whether Buying or Selling, we want to earn your business. Contact us today to see why we are different.